After nearly a decade of deployments, surges, and setbacks, after thousands of lives lost and over one trillion in taxpayers dollars spent, President Obama has announced that – in keeping with the timetable originally established by President Bush – all U.S. troops will withdraw from Iraq by the end of the year. At a time when the economy is at the forefront of America’s attention and concerns about an over-stretched military are increasing, many will view the redeployment of our Iraqi military contingent as a good thing for the country. Others undoubtedly will lambast the decision as a short-sighted abandonment of the mission in Iraq. In order to evaluate the wisdom of a total troop withdrawal, several questions must be asked and answered. A good place to start would be to revisit the rationale that was offered for our engagement and ask ourselves whether or not it was warranted in the first place. The Bush administration built its case for war on the claims that Saddam Hussein possessed weapons of mass destruction, that he was engaged in dangerous relationships with radical Islamist terror groups, and that this combination of factors posed a grave threat to the security of the free world. At the time that this case was advanced, both the Congress and the American people found these to be compelling reasons to move forward with combat operations in Iraq. In the ensuing years, as the insurgency exploded, casualties rose, and the evidence of WMD waned, public and political support for the war tanked. But then there was the Surge, which seemed to reverse our fortunes and offer hope that Iraq was not a lost cause after all. Now, as our engagement draws to a close and we review the roller coaster ride that has been the last nine years in Iraq, what takeaways do we have that can inform our decision making the next time we are confronted with an apparent call to arms abroad? What, precisely, have we accomplished? Is America safer and more secure today than we were before the Iraqi intervention? Have our efforts succeeded in establishing Iraq as an anchor for democracy in the notoriously repressive region? Have we provided a framework for Sunnis and Shiites to resolve future conflicts without resorting to violence? Do the Iraqi people appreciate America for its role in liberating them from the tyranny of Saddam? Will the country descend into chaos without an American presence to maintain order and stability? What return on America’s investment of blood, sweat, toil and tears did the war yield? The American people deserve straight answers to these questions, but so far no politician has stepped up to offer a candid assessment. Will Mr. Obama answer these questions? Will the Republican aspirants for President offer anything more than sound bites in response to them? Are they capable of addressing anything other than the economic issues of our time? They better be, because the so-called War on Terror has not only drained our treasury, it has taken an enormous physical, mental, and emotional toll on the young warriors and their families who’ve born the brunt of this war. For them, the price of our engagement has been far more than economic. During military conflicts, the fog of war often obscures the combatants’ vision, but now that our troops are returning home, we must engage in a clear and sober assessment of whether our mission was really accomplished. 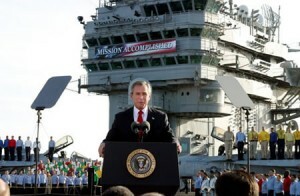 We don’t need photo ops of the President in a flight suit on the deck of a carrier with a banner declaring “Mission Accomplished,” we just need the cold hard truth. Was it worth it – why or why not? Do we have the courage to ask this question given all that has transpired? More importantly, will our leaders answer it?